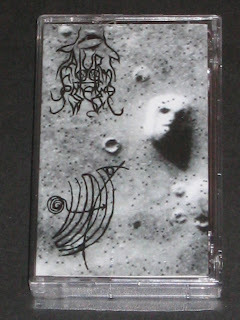 Format: Cassette release on the Depressive Illusion Records label (Ukraine) from 2011, cat ref cut234. This is a split release with Anhedonia (Russia). 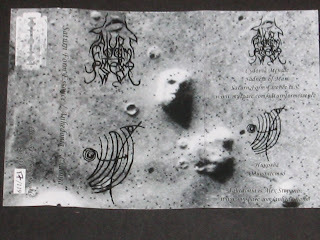 The SFE website dedicates this release to the planet Mars. The name "Cydonia" has a multitude of references across both cultural and earth-science bases. For instance: Cydonia was the goddess of heroic endeavour in Greek mythology; is a location in Crete; is a monotypic genus of flowering plants in family Rosaceae, containing only the fruit tree Cydonia oblonga (quince); and is a main belt asteroid (1106 Cydonia). It's also turns out to be a popular subject in music, being the title of a 2001 album by The Orb; a song by British rock band Muse (Knights of Cydonia) and in 'Hunting and Gathering (Cydonia)' by Sunn O))) from 2009, and also included in a a song by British symphonic black metal band, Bal-Sagoth Beneath the Crimson Vaults of Cydonia (2006). Perhaps more familiarly, however, Cydonia is known as a famous region of the planet Mars - the so-called 'Face on Mars' In this latter context it has attracted both scientific and popular interest. The name originally referred to the albedo feature (distinctively coloured area) that was visible from Earthbound telescopes. The area borders plains of Acidalia Planitia and the Arabia Terra highlands and includes the Mars regions: "Cydonia Mensae", an area of flat-topped mesa-like features, "Cydonia Colles", a region of small hills or knobs, and "Cydonia Labyrinthus", a complex of intersecting valleys. As with other albedo features on Mars, the name Cydonia was drawn from classical antiquity, in this case from Kydonia, a historic polis (or "city-state") on the island of Crete. Cydonia contains the infamous "face on Mars" feature — located about half-way between Arandas Crater and Bamberg Crater. The face is featured on the cover artwork for this release, and to some is evidence of intelligent design and thus proof of life beyond Earth. To others, it is a chance formation of rock and not a question of design but interpretation into a familiar pattern by the eye and brain. The "face on Mars" (about 1.5 kilometers - one mile - across), has had special notoriety in Western culture since it was imaged in 1976, because it looks, well... like a face. When it was first imaged, and into the 21st century, the "Face" is near universally accepted to be an optical illusion, an example of pareidolia. After analysis of the higher resolution Mars Global Surveyor data NASA stated that "a detailed analysis of multiple images of this feature reveals a natural looking Martian hill whose illusory face-like appearance depends on the viewing angle and angle of illumination". Similar optical illusions can be found in the geology of Earth; examples include the Old Man of the Mountain, the Pedra da Gávea, the Old Man of Hoy and the Badlands Guardian. Conversely, the Cydonia facial pareidolia inspired individuals and organizations interested in extraterrestrial intelligence and visitations to Earth, and the images were published in this context in 1977. Some commentators, most notably Richard C. Hoagland, believe the "Face" to be evidence of a long-lost Martian civilization along with other features they believe are present, such as apparent pyramids, which they argue are part of a ruined city. Sceptics point out that there are other faces on Mars, often much clearer, but their images do not elicit the same level of study. An example is the Galle Crater, which can show a rendition of a smiley, or a profile of Kermit the Frog and the ESA "skull" formation, which is a few kilometres south of the "Face". The first challenge to overcome with this release is to determine which side is which:the tape is blank, and my copy came part wound through with no indication of which side is A or B, let alone which band corresponds with it! A random rewind and press of play sooon reveals the unmistakeable tones of Saturn Form Essence, with both tracks accentuated by the general drone and general ambience of a trip through the heavens, speeding at the rate of a trapped fly passing slowly through a block of amber. Anhedonia's songs are a little more varied, to the extent of using samples of narrative from (presumably) film scores: not an experience that proves unlistenable by any margin, but not my personal preference in this context.